Halloween in Nevada is a time to revisit ghost towns, ghost stories, and, if you’re (not so) lucky, see a few ghosts. Arm yourself with garlic, crucifix, and holy water and head out to the following five best haunted attractions in Nevada. You’re sure to spook up a good time. 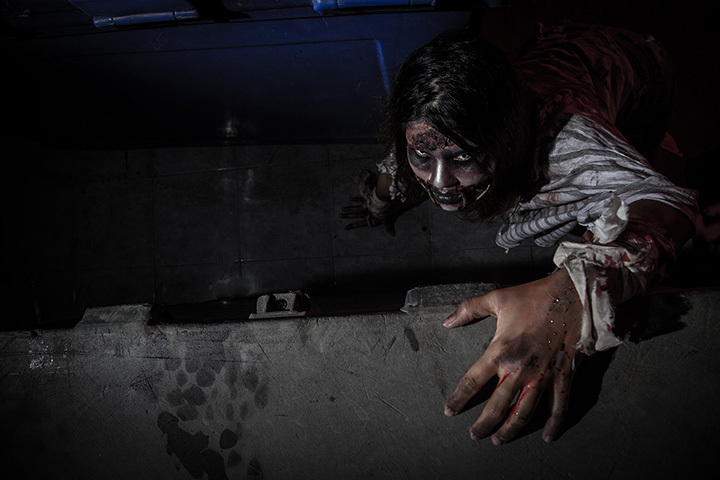 Las Vegas Haunts celebrates over “20 Years of Fear.” Choose between regular, early bird, and VIP tickets for the three main attractions: Asylum, the Foeray Family, and the Terror. Las Vegas Haunts, located in the Meadows Mall, is open every Thursday—Sunday in October! Bonnie Screams in Red Rock Canyon provides two of the scariest activities known to mankind: zombies and paintball. If you happen to be a paintball fanatic, however, then there is no better place to get your spook on. Zombie paintball runs throughout October and is exactly what it sounds like. Carson City is known as one of the most haunted cities in Nevada and with the Carson City Ghost Walk, you can experience the fear for yourself. Get your ticket online early for the Madame Curry and the Vampire Hunters show, available until mid-October. Andelin Family Farm transforms into a Halloween fright fest every October. Kids will love the pumpkin patch and corn maze, whereas adults can get their zombie shooting on with the zombie paintball. Check their website for upcoming events.